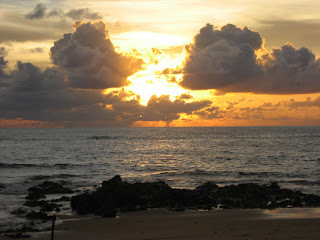 Khao Lak was one of the towns in Thailand severely affected by the Tsunami. The tourism industry here has suffered greatly as a result. Because the Tsunami Volunteer Center is based here, volunteers from all over the world found their way here over the past 4 years looking for a way that they could lend a helping hand. As the community is rebuilding, TVCs efforts are part of the fabric of the town. Some volunteers came here to help out and found a new place to call home in the process. Some come for a month every year. Others stop in to help out for a few days and then are on their way. But whether you're here for 2 days, a month or 10 years, it's easy for Khao Lak to feel like home. There's not much use of cell phones around here. There's no need for it. It's beautiful out so why not just stroll up the street and see if anyone you know is at Lazy House Bar. If not, why not just chat with the people who are there and make a new friend. It starts downpouring on your way? No big whoop. It's refreshing and it'll probably only last for 15 minutes. Volunteers and locals gather together for dinners on an almost daily basis on one of the zillions of delicious places to eat. Maybe go for a swim afterwards. Or, maybe it's TVC volunteer party night. 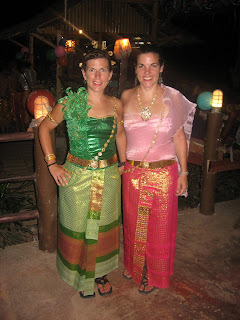 Here's Kristen and I dressed up for the Traditional Thai dress party. John, one of the aforementioned volunteers who decided to stick around Khao Lak, created the website amazingkhaolak.com. Check it out. And start planning your next trip. You won't regret it. You guys look gorgeous, but imagine supporting THAT wardrobe every day!